welcome! I have created a luscious soap from my Fiery Wall of Protection oil! Now, you can wash away those bad situations, people and vibes and put up an invisable barrier between you and them! ake your path as clear and easy as possible by avoiding all the B.S.! 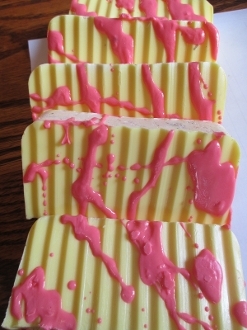 This is soap is created using a two step process to get the two colors of soap to swirl into an energetic pattern. It requires much more time but I love the look and results! Created with 100% pure frankincense and cinnamon essential oils, cinnamon powder, frankincense resin and pyrite. Pyrite possesses the element of fire (pyre mean fire in Latin) due to it's sulphur content. It sparks red if you light it. It is also know to draw in luck-so burn away the junk and draw in some good fortune with this soap! Listing is for 1, 3-4 ounce bar. thanks for looking!